The Deer Hunter is a film I saw a long time ago and have been meaning to rewatch for a while, but kept putting it off. I’ve been putting it off because it’s notorious for being a long and difficult watch and I have vague memories of the infamous Russian roulette sequences being particularly horrific. I still put off a rewatch by ignoring an offer to review this new 40th Anniversary re-release of the classic 70s drama, but when a copy showed up on my doorstep anyway, I figured I should bite the bullet (pun intended). The film tells the story of a group of friends living in a small industrial town in Pennsylvania in the late 60s (and into the early 70s as the film goes on). One of them, Steven (John Savage), is getting married but shortly after the ceremony he and two others, Michael (Robert De Niro) and Nick (Christopher Walken), are due head off to Vietnam to fight for their country. The group, bar Steven, squeeze in one last hunting trip before they go. Once in Vietnam, the three friends happen to meet and get taken prisoner. They’re forced to play ‘Russian roulette’, which involves loading a pistol with 1 round and passing it between the two ‘contestants’, forcing them in turn to put it to their heads and pull the trigger until the gun goes off. The friends miraculously manage to escape their floating prison, but they get separated, with Steven getting his legs badly broken before Michael hands him over to medical officers. Michael eventually heads home, but it’s not the same and he struggles to re-adjust, as does Steve who we find had both his legs amputated. Nothing is heard from Nick (although we see him lost and unable to face his friends and family back home) and his fiancé Linda (Meryl Streep) tries to find comfort in Michael’s arms. The two seem to have had a connection even before going off to war and this is in one way strengthened now by their shared sense of loss over Nick, but also weakened by his shadow looming over the doomed relationship. Unable to bear it any longer, Michael decides to go back to Vietnam and find Nick. 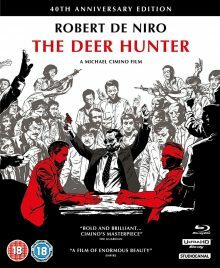 I’m certainly glad I chose to watch The Deer Hunter again and review it, even if I initially fobbed off the chance, as it really is a fantastic film and more than simply a ‘challenge’ to watch. For one, it captures real life so effectively, particularly in the first hour of the film. I’ve heard people badmouth the initial third, saying it’s far too long and unnecessary to the plot, but watching it again I appreciated its strengths. Yes a good hour or so goes by of time spent largely just establishing characters and arguably you could trim an awful lot off the epic wedding scene. 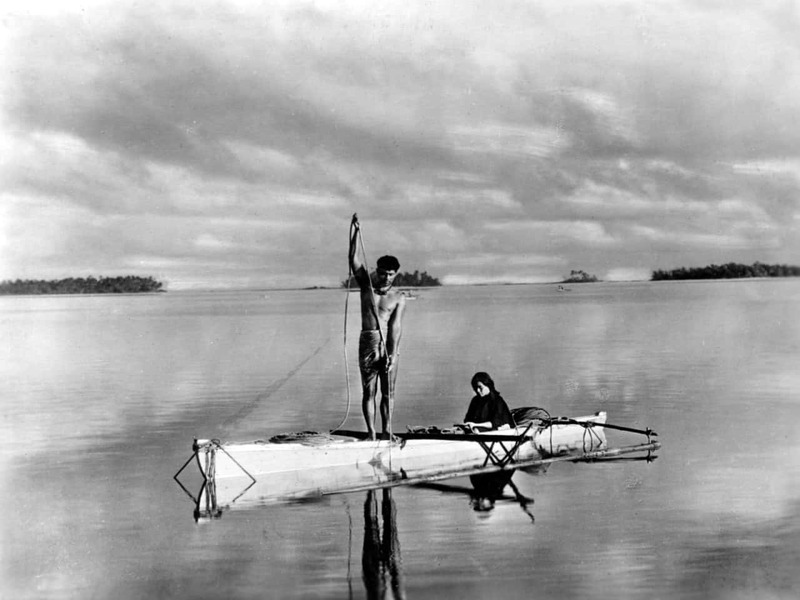 However, I found it helped create an incredible sense of community and friendship. You truly get to live with the characters in their day to day lives. You see their ups and downs and it’s a genuine pleasure to hear the core group of friends joke around with each other and let rip at the beer and booze-soaked wedding reception. The lengthy build up also helps sell the dramatic shift between the Pennsylvania scenes and those in Vietnam. And what a huge shift it is. In what is possibly one of the harshest cuts in cinematic history (tonally speaking), we jump from drunken shenanigans between friends, capped off by a quiet poignant musical moment, to slap bang in the middle of the Vietnam conflict. We don’t see any training, we don’t enjoy camaraderie at camp, we are simply thrown into a situation where Michael is injured and struggling to stay alive amidst explosions and devastating cruelty. We witness a Vietcong soldier drop a grenade in a tiny hideout crammed with women and children, among other things, before the three friends meet briefly before being captured. The film spends little over an hour of its 3 hour running time in Vietnam, including sections where we go back later on, but these will sear themselves into your memory for a long time. The Russian roulette sequences in particular are deeply disturbing, but all of the time spent in the country is relentlessly grim. It’s a brutal depiction of war that offers no chance of enjoying proceedings as some war films do when they revel in recreating the firefights like an action movie. Some critics have felt the film’s depiction of the Vietcong is insensitive and there aren’t many accounts of Russian roulette being played at the time, but the sequences work in symbolically representing the brutality of the conflict. The performances are superb across the board. De Niro was already pretty big at the time, but the rest were relative up and comers back then. Savage, who never became a household name like the rest of the cast, deserves a special mention in a tough role. It’s also moving to see John Cazale play one of the friends who stays home, as it was his final performance. He died not long after shooting The Deer Hunter. He had cancer and producers tried to have him fired when they found out, as they were worried he’d die half way through the shoot. Cimino and Streep (who was in a relationship with Cazale at the time) fought his corner though and he remained in the cast. The film topped off possibly the strongest acting filmography of all time. Yes, Cazale only starred in 5 features before his death, but each of those five films is an absolute stone-cold classic. It’s a crying shame he didn’t live longer to add to that collection. The film also looks incredible. Shot in glorious 70mm widescreen by the great Vilmos Zsigmond, the use of movement, light, colour and framing is truly exceptional without ever feeling unnatural or staged. The Vietnam sequences are given a heavy grain and desaturated look to further emphasise the grimness of life over there. If I were to criticise the film, I’d say it occasionally paints a too oppressively bleak picture in the latter two thirds. I wouldn’t expect everyone to be laughing and dancing again after the war, but I felt a touch more hope wouldn’t go amis. The transformation of Steven’s wife for instance felt a bit too much. The same goes for the depiction of the Vietcong as mentioned earlier. I think the film might have benefited by presenting at least a hint of sympathy for some the Vietnamese soldiers. They too came from poor, simple backgrounds and lost loved ones, but there’s not suggestion of that here. If you can accept the way Cimino wanted to tell the story though, there’s little else you can criticise here. Yes, it’s a long, tough watch, but it’s beautifully made and still packs a mighty punch. Maybe it lays it on a little thick at times, but the incredible performances help keep it nuanced. It’s not a film to watch regularly, but it’s an experience you need to give yourself every decade or so as a reminder of the cost of war as well as how bloody good cinema was in Hollywood during the 1970s. The Deer Hunter is out on 20th August in a 40th Anniversary Collector’s Edition 4K UHD + Blu Ray, as well as a straight up Blu-Ray package in the UK, released by Studiocanal. I saw the Blu-Ray version and the film looks and sounds fantastic. – Deleted and Extended scenes: Deleted and extended scenes from the original production including extra footage of the infamous Russian Roulette sequence. There’s a lot of great material here. I spotted a couple of conflicting accounts of things that happened, so it can be hard to know who to trust, but it’s all entertaining and interesting to hear. It’s great to hear David Thompson’s thoughts on the film too as he’s always been one of my favourite critics. The deleted scenes are raw and unedited, so it’s nice to see the cast do their thing without the polish of editing, sound design and music. It’s a great package which is easily recommended, even to those who already own the DVD.